Very sturdy, makes summer walks more fun for a lazy child! Quite expensive for how much I actually used it. Having a lazy five year old can make walking very stressful, this device changed that completely! Whenever he was tired or grumpy, hopping on to the board was a fun experience for him while he rested his legs. If you do not drive then this is the perfect accessory, however I do so I felt this didn’t get used as much as I’d like for the price I paid. Pros: • long walks • easy to assemble • steering the pushchair is still easy • fun for child. Having purchased an oyster for my first born, I needed to upgrade our set up when her sibling came along. We didn't need a double buggy but a buggy board seemed like a smart idea, and boy did that idea pay off! The oyster buggy board is brilliantly simple to use, not hugely pricey and doesn't hinder use of the pushchair. Easy to attach/detach and fold away when not in use. The buggy board was the most convenient thing I have ever purchased. Very easy to attach and detach. Convenient for short and long trips with the buggy. My little girl was 2 years old when we started using it she never had an issue standing on the board, it glided with the buggy so was comfortable for standing on. Overall I was more then happy with the purpose and convenience it had in our daily lifes. 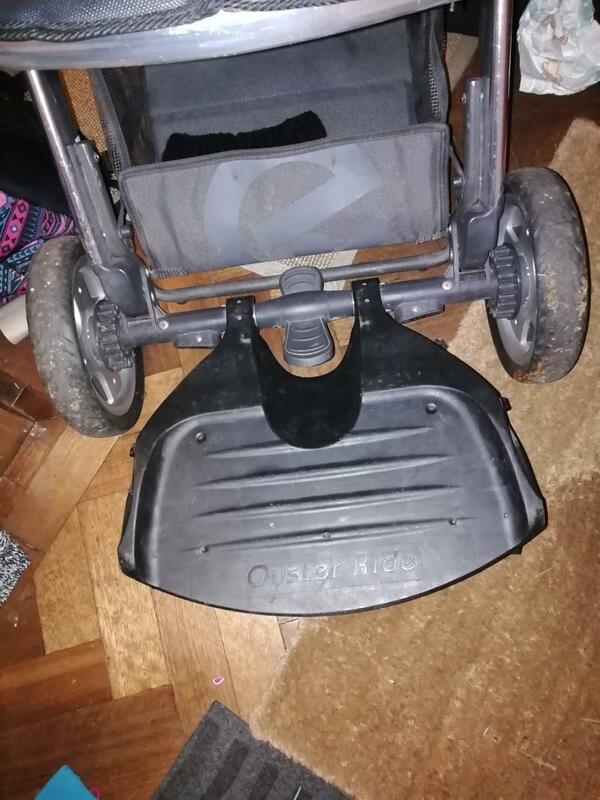 This is a great itam and handy on long journeys for little legs, also good for holidays as it is easy to attach to the pram and easy to store away once finished with. The down side is when I'm walking I catch my feet if I don't give enough distance. This is great really easy to store and when out and about its very handy and kids dont feel uncomfortable on it. Would 100% recommend i can't fault it. This is really handy when you have a three year old who doesn’t want to walk and no spare arms to carry them. Simple and easy to use. Easy to attach and folds away easily. Takes W but of getting used to walking with it in my oyster 2. Tall people with longer strides my struggle. Was worried my under 2 year old would hate it but she loves it and enjoys folding it away when done. The bag sandwiches her in too so she stays on the board. Goes up and down curbs well. I get her down when going up steps. 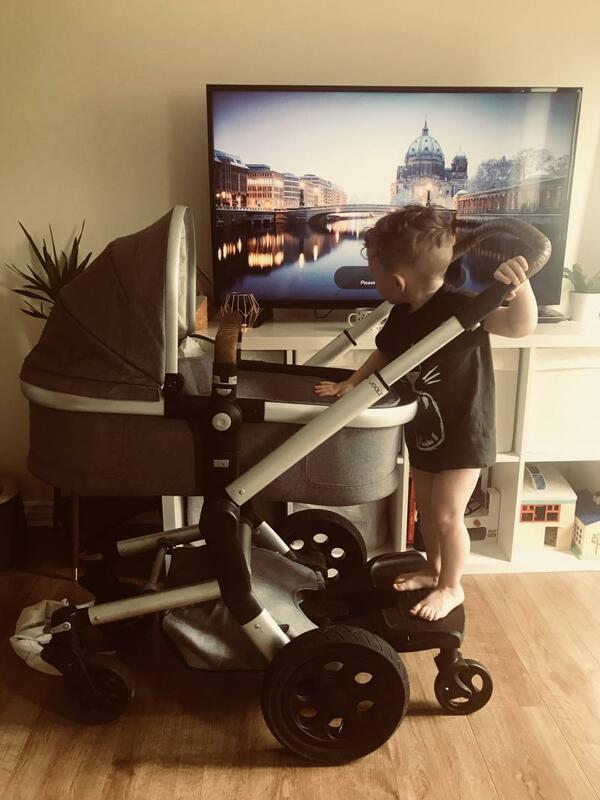 I use ours with our Oyster Max when using just carrycot, toddler loves standing on this product, attaches easily to chassis base and will last a while as well made. However where it clips up when not in use it sometimes jams and then becomes stuck in the basket area, isnt the easiest thing to unjam when trying to keep a toddler still too! Absolutely love this item. So convenient and tucks up nicely so you don’t hit your feet on it. My biggest concern was just this, that my feet were going to hit it however I have not had this problem. If you have an adjustable handle then pulling it all the way out also makes it much easier to use. The oyster board is something we bought when looking for a pram for our second baby, Indie! We had got a Joolz day pushchair for her but with her being a second child and her older brother only being 3 at the time of birth I thought I was best to get a ride on board too! 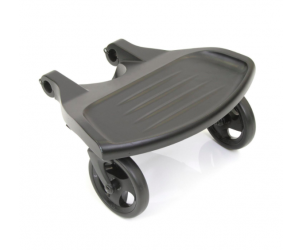 The Oyster board fits perfectly to the chassis and is super easy to manoeuvre and use! Archie loves it too!! I bought it 6 months ago. My older daughter is 5 years old but we love is especially when we going to school and don't have enough time. The Babystyle Oyster Ride-On Board is ideal for families on the go. No need for a double buggy when out and about with more than one child, while your smallest relaxes in their Oyster system, your older child can also catch a ride on the Oyster Ride-On Board. 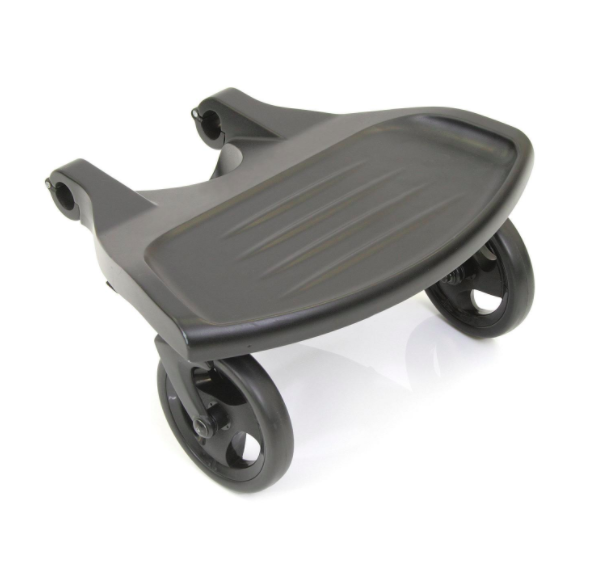 Easy to attach to your Oyster chassis, the Ride-On Board is safe and sturdy.